I am a travel writer, naturalist, photographer and tour leader specialising exclusively in the little-known and enigmatic Indian Ocean island of Madagascar. 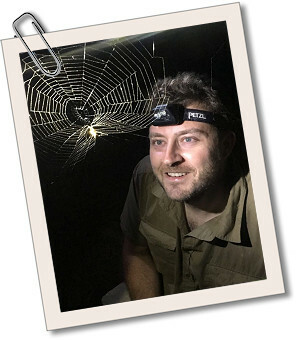 Born and based in the UK, I visit Madagascar at least once every year to explore and photograph its diverse wonders, carry out research and to share my knowledge and interest through leading tours. I have written a number of books on Madagascar and its wildlife, but my passion for this country stems from more than just an interest in flora and fauna; it is rooted in the realisation long ago that Madagascar – the world's only truly Afro-Asian nation – is as deeply fascinating culturally, linguistically, historically and geologically as it is for its famously unique and endemic wildlife. On this page you can discover more about my various involvements with Madagascar, find details of my upcoming tours, learn more about my books and where to buy them, and get information about my photography. You will also find information on my extensive archive of Madagascar-related books and documents and my role as Secretary of the Anglo-Malagasy Society. Below are detailed some of my Madagascar tours, both past and future, listed in reverse chronological order. If you are interested in booking to go on one of my upcoming tours, check the Status column in the table below to find one that is not shown as fully booked, then click the Enquire link to open the website of the relevant tour operator whom you need to contact in order to make the arrangements. Please note that prices may vary widely from tour to tour, owing to significant differences in accommodation level, itinerary, trip duration, transport arrangements, whether international flights are included, and so on. For tour operators or trip organisers wishing to secure my services to lead or accompany a tour of/including Madagascar, please contact me (see the bottom of this page) as far in advance as possible. For more information on any upcoming tour that is not yet fully booked, click the 'Enquire' link in the 'Status' column. 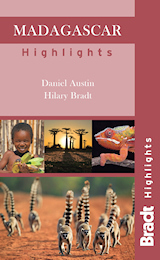 I have authored a number of books on Madagascar: two travel guidebooks co-authored with pioneering travel writer and long-time Madagascar authority Hilary Bradt, and one guide to the country's wildlife co-authored with award-winning wildlife photographer and zoologist Nick Garbutt. Things can change fast in Madagascar so preparing new editions of these titles is a more-or-less continual task! Having extensively used and admired previous editions of Madagascar: The Bradt Travel Guide, I was proud to be invited in 2006 to contribute to the ninth edition. Since then (it is now in its 12th edition), I have taken over full responsibility for researching and writing new editions. I also run a Bradt Madagascar Facebook page to keep readers and travellers up to date with developments in Madagascar between editions of the guidebook. In contrast to this 'main' guidebook, which is ideal for backpackers and independent travellers, Madagascar Highlights is a guidebook aimed at travellers on organised tailor-made trips, group tours, cruises and similar. In short, it is aimed at travellers who will have somebody else doing the nitty-gritty of trip planning on their behalf: in effect, it's like all the juicy and interesting bits of the 'main' guidebook but without the heavy logistical detail. Madagascar Highlights is a full-colour guide, illustrated throughout with beautiful photographs, so that it also serves as an attractive trip souvenir. 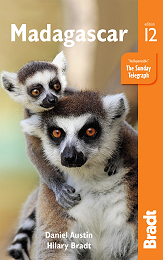 Madagascar Wildlife: A Visitor's Guide is also a lavishly illustrated, full-colour book. 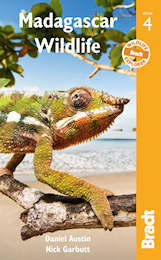 It focuses on the fauna group by group – mammals including lemurs and tenrecs, birds, frogs and reptiles including chameleons and geckos, and invertebrates – but also has a detailed 47-page section on the main parks and reserves of Madagascar. In addition to authoring these books, I was copy-editor of the revised edition of Madagascar: The Eighth Continent by Peter Tyson. I also occasionally write magazine and web articles on Madagascar. Since my very first visit to the island, I have been photographing flora, fauna, people and landscapes across the country. Never have I visited any other place in the world that is so photogenic; even after so many years of exploration, I find myself confronted with new and unusual scenes on a daily basis. With approaching 90 per cent endemicity amongst the Malagasy plants and animals, it is a wildlife photographer's paradise. Over the years I have built up a large personal collection of images. You can see some of them on my Madagascar Photography website. To see more of my photos in future, you may also like to follow my Madagascar Photography Facebook page and my Madagascar Photography Twitter account. My photographs have appeared in several books, magazines, brochures and elsewhere. If you are interested in licensing any of my photography for your use – whether in a book, magazine, advertisement, brochure, presentation, or other usage – please get in touch (see the bottom of this page). Pricing varies according to usage (chosen media, size of reproduction, distribution area, circulation, duration of use, and terms of exclusivity) so in order to give you a quote I will need you to provide details of your project. (If you work for a publisher which has standard photographer rates then I am happy to work within those if the terms are reasonable, and to offer bulk discounts where multiple images are used.) All of my photos are available in high resolution of at least 2848 x 2136 pixels. I currently shoot primarily on a Nikon D600, which provides high resolution images of 6016 x 4016 pixels (24MP). I am Secretary of the Anglo-Malagasy Society, a UK-based organisation founded in 1961 – just after Madagascar's independence from France – to foster relations between the country and Britain. Several times a year, we hold events and meetings in London to promote knowledge of Madagascar, usually with talks from interesting speakers, buffet Malagasy food, and sometimes live Malagasy music too. Non-members are very welcome to attend Anglo-Malagasy Society lectures and events. You can find a list of forthcoming dates in the events section of the Anglo-Malagasy Society Facebook page; bookings can be made online via the tickets page on the Anglo-Malagasy Society website. If you are interested in becoming a member of the society then visit website's membership section for more details. The society's mission is to further friendship and co-operation between the people of the United Kingdom and those of Madagascar, to establish and foster cultural links between the two nations, to make Madagascar more widely known in the United Kingdom, to assist British companies interested in establishing and maintaining business relations with Madagascar, to encourage more people to visit Madagascar, and to welcome and assist Malagasy nationals – especially students – visiting or settling in the UK. I am also responsible for running the society's social media profiles, via which we share some society news and details of upcoming events, but mainly news stories concerning Madagascar. If you would like to keep up to date with news from Madagascar, you can follow the Anglo-Malagasy Society Facebook page and the Anglo-Malagasy Society Twitter account. If you would like to consult any items in my collection, or have items that you would like to donate to the Madagascar Library, then please contact me (see the bottom of this page). The easiest way to reach me with a private message is via the contact form on my Madagascar Library website.